Wigan are now nine league games without a win after Everton's Victor Anichebe came off the bench to equalise late on. A dull game came to life in the last 15 minutes when Phil Neville tried to cut out Jean Beausejour's cross. His interception bounced towards Tim Howard - but the Everton goalkeeper was deceived by the spin and the ball looped into the net for an own goal. 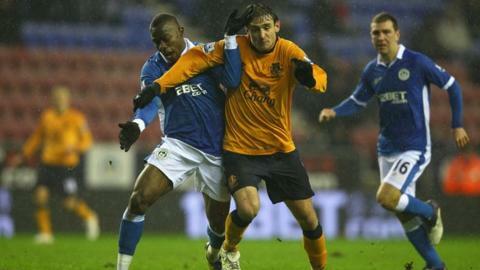 But bottom side Wigan, without a win since 10 December, were denied victory when Anichebe powerfully headed home. For Everton, so impressive in beating leaders Manchester City in midweek, it was a disjointed performance, despite a strong showing from Steven Pienaar after his return to the club on loan from Tottenham. The South African, supporting lone striker Denis Stracqualursi from the flank, made all the running in a dull opening half-hour, on one occasion superbly beating three men in midfield only to find his Argentine team-mate offside. Franco Di Santo went close for the hosts when he latched on to a long ball from Maynor Figueroa but Howard was swiftly off his line to save at his feet. But it was Darron Gibson, match-winner against City, who spurned the only clear chance of the first half. Former Wigan left-back Leighton Baines burst down the left and cut it back perfectly for the former Manchester United man, who thrashed his effort high and wide. "Tim Howard is usually one of the most reliable goalkeepers in the league but he was beaten like Matt Prior off a spinning wicket in Abu Dhabi. Wigan are still five points away from safety and they have Bolton away next weekend." Everton boss David Moyes introduced captain Neville for the injured Tim Cahill at the break but, despite more bright play from Pienaar and Landon Donovan, they could not manage a breakthrough. The biggest cheer of the day came when Everton's new £5.5m striker Nikica Jelavic came on for Stracqualursi, and the Croatian was involved immediately as he cleverly stepped over a Tony Hibbert cross but Wigan cut the ball out before Marouane Fellaini could reach it. Stalemate was then averted as Neville inadvertently put Wigan ahead. The impressive Beausejour fizzed in a cross from the left which Neville cut out at the near post, only for Howard to be beaten by the spin. Everton rallied almost immediately, however, levelling the scores with eight minutes remaining when a corner from Baines was returned to the full-back. His second cross found Anichebe, who scored with a powerful header. Wigan manager Roberto Martinez remained upbeat despite his club's predicament, five points from safety. "It was a very good performance and we are obviously desperate to get points," he said. "In the last two games we have been disappointed with ourselves and got a little cagey but I really enjoyed the performance today. "We got on the ball, created chances, scored the first goal and we got punished when we had a period of not being able to control the game." Moyes felt his side had not fully recovered from their exertions against Manchester City. "Our efforts in midweek told on us today, but after we went goal down we lifted it," said the Scot. "It was a massive deflection off the pitch for their goal, but we never looked like we were going to concede and it was just whether we were going to do enough to score at the other end. "I thought Steven Pienaar was the best player on the pitch by a mile - he made us play better football and he has lifted the dressing room. You never know what you are getting back but he was superb."